Changes associated with aging skin lead to changes in appearance that cause distress to many women and men, and lead them to seek aesthetic treatment. Fortunately, an increased understanding of the underlying pathophysiologic changes has led to development of aesthetic agents that target underlying mechanisms and injection techniques that result in a natural, balanced, and pleasing appearance. 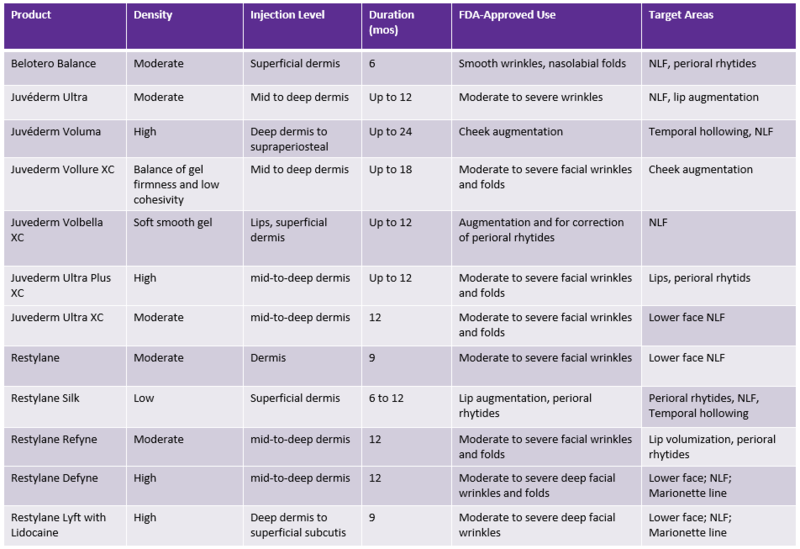 The aims of this article are to summarize best practices for product selection and injection of hyaluronic acid fillers to optimize aesthetic outcomes and minimize the risk for adverse events. The faculty for the program includes experts in advanced aesthetic techniques. This educational program will review key information about facial and vascular anatomy, selection of the most appropriate hyaluronic acid product based on rheology and physical properties, and advanced injection techniques using both a needle and a blunt-tip cannula. Adapted from Costa CR, et al. Plast Reconstr Surg. 2016;138:233e; Bogdan Allemann A, et al. Clin Interv Aging. 2008;3(4):629-634; US Food and Drug Administration. Approved Dermal Fillers; Available at: https://www.fda.gov/MedicalDevices/ProductsandMedicalProcedures/CosmeticDevices/WrinkleFillers/ucm227749.htm#approved; Bloom M and Palm M. 2018 personal communication. Choosing the most appropriate cannula for the chosen product and area to be injected must be given careful consideration. Delicate tissues (ie, lips and the tear troughs), require a smaller cannula (eg, a 27-gauge cannula). More robust tissues, such as the midface, melolabial folds, nasolabial folds, and hands, require a larger-gauge cannula (eg, a 25-gauge, 1.5 inch long cannula) in order to accommodate products with higher viscosity and allow for threading through thicker tissues. Injection techniques and location of injections compared with the vascular and neurovascular anatomy are of paramount importance to minimize adverse events. When performing microinjections, injection techniques include linear threading, crosshatching, fanning, serial puncture, or even a combination of several of them, depending on expected results, in order to receive an optimal result. [Landau 2015] NOTE: It is very important to watch the videos demonstrating the injection techniques – the best practices for each injection area are summarized below. Although the demonstrations were performed using the non-animal stabilized hyaluronic acid (NASHA) line of products, one can use any FDA-approved product with similar physical properties (Table A). Cannula injection of the tear trough: The ideal filler has a low level of hyaluronic acid crosslinking. Create an entry port with a 25-gauge sharp needle based on a diagonal line at a point on the anterior cheek. Use a 27-gauge, 1.5-inch cannula. Insert the cannula below the level of the orbicularis oculi muscle, advancing the cannula perpendicular to the tissue. Cannula injection of the mid-face and cheek: Ideal fillers are a combination of a hyaluronic acid with a high G prime (eg, a large particle hyaluronic acid) and a different product with a good combination of support and flexibility. Create a pilot hole with a 23-gauge sharp needle and use a 25-gauge, 1.5-inch microcannula for the injections, using a lift and tack or layered lifting technique. Inject about 2/3 of the product onto the periosteum of the midface and about 1/3 of each aliquot coming up through the deep fat pads and into the superficial fat pads. Create another pilot hole in the area that was previously injected and use a 25-gauge, 1.5-inch microcannula for the midface volumization, using a radial threading technique to treat the anterior midface. Cannula injection of the lips: A small particle hyaluronic acid filler with lidocaine is the only FDA-approved product for injection in the lip area with a microcannula. Four important factors to consider are: 1) the definition of the vermillion border; 2) the fullness of the lips; 3) the pout; and 4) the proportion of the top and lower lips. Create a pilot opening at the corner of the mouth with a 25-gauge needle to be used with a 27-gauge, 1.5-inch microcannula. Inject 0.1 to 0.2 mL of filler in each of the four quadrants (pillows) of the lip. Next, angle the cannula into the top lip in the submucosal plane to inject first into the dry red lip, then aim into the mouth at the wet-dry border and even more posterior or lingual to that in order to push or roll the lip out. Repeat this technique for the other side. Use the sharp needle to give more definition to the top lip at the vermilion border in the lateral Cupid’s bow. One can complete this area by injecting the marionette area with a 30-gauge needle. Begin with the pillar of the marionette area and inject very slowly using very small quantities of product, working from the jaw line up to the oral commissure. Microinjection of the forehead: The filler (small particle hyaluronic acid with lidocaine) is mixed with 0.3 to 0.5 cc of 0.5% lidocaine with epinephrine buffered with bicarbonate in a 0.3 cc syringe, and is ideal for the forehead as it provides a thinner product that is more easily molded into thinner tissues. Inject at least 1 cm above the orbital rim because it is a safe place that is super-periosteal on top of bone and below the area where important vessels are located. Inject down to bone on the super-periosteum and march over laterally going very slowly and using small aliquots. Finish laterally, injecting perpendicular to the surface of the skin. Microinjection of the neck: The filler is mixed with 0.5% lidocaine with epinephrine buffered with bicarbonate for vasoconstrictive effect and to minimize the degree of swelling and bruising. A sharp needle is the only appropriate approach for placing filler in the neckline. Bending the needle allows for a tangential approach while working from the right side of the neck. Inject in an anterograde and retrograde linear threading pattern to subcise and fill the neck lines. When performing microinjections or blunt cannula injection of hyaluronic acid, prevention and management of adverse events must always be top of mind. Safety techniques include aspiration after insertion to ensure the needle/cannula is not in a vessel and injection of small, precise aliquots at a slow rate. If resistance is encountered and/or the patient experiences pain, the injector should stop and reposition the cannula or needle prior to injecting more filler. [Signorini 2016; Beleznay 2015]. Interaction between the hyaluronic acid fillers and the tissues may cause immune-mediated and delayed-type hypersensitivity reactions. Patient monitoring after the injection (blanching or other warning signs) can facilitate prompt management. Full correction requires several sessions. After results are achieved, patients should be reassessed every 3-6 months. Treatment touch-ups usually occur at a frequency of about every 6-9 months. Hyaluronic acid fillers have gained popularity in recent years. To achieve naturally appearing results and minimize the risk for adverse events, it is important to gain mutual agreement on realistic treatment goals, select the most appropriate fillers based on an understanding of physical properties and rheologic characteristics, and follow meticulous advanced injection techniques. Patient education to clearly set expectations about post-injection care, timelines required to see optimal results, and the need for repeat injections is also important to optimize patient satisfaction, safety, and outcomes. Beleznay K, et al. Dermatol Surg. 2015;41(10):1097-1117. Chopra J, et al. J Drugs Dermatol. 2018;17(1):10-16. Costa CR, et al. Plast Reconstr Surg. 2016;138:233e. ade Maio M, et al; Alliance for the Future of Aesthetics Consensus Committee. Plast Reconstr Surg. 2017;140(2):265e-276e. bde Maio M, et al; Alliance for the Future of Aesthetics Consensus Committee. Plast Reconstr Surg. 2017;140(4):540e-550e. Fulton J, et al. J Drugs Dermatol. 2012;11(9):1098-1103. Hilton L. Facial Anatomy At A Glance. Available at: http://aestheticchannel.modernmedicine.com/aesthetic-channel/news/facial-anatomy-glance?page=0,3. Accessed April 9, 2018. Kerscher M, et al. Dermatol Surg. 2008;34:720-727. Landau M, Fagien S. Plast. Reconstr Surg. 2015;136:188S. Paliwal S, et al. Plast Reconst Surg. 2014;134:1224-1233. Pierre S, et al. Dermatol Surg. 2015;41:S120–S126. Signorini M, et al; Global Aesthetics Consensus Group. Plast Reconstr Surg. 2016;137:961e. US Food and Drug Administration. Approved Dermal Fillers. Available at: https://www.fda.gov/MedicalDevices/ProductsandMedicalProcedures/CosmeticDevices/WrinkleFillers/ucm227749.htm#approved. Accessed April 9, 2018. Van Loghem JAJ, et al. Aesthet Surg J. 2016;38(1):73-88. Participate in the following ECHO™ —a digital reinforcement tool that emphasizes content from the Aesthetics activity series. 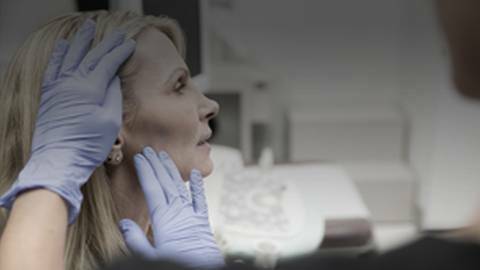 Minimally invasive, soft tissue filler use continues to rise in the US and plays an integral part in the correction of aesthetic changes associated with aging. The microinjections and blunt-tip cannula injections provide experienced aesthetic practitioners with an alternative to traditional dermal fillers. This educational activity will highlight some important factors to consider as you improve your technique and implement these advanced techniques into your practice. Dr. Palm receives consulting fees from Allergan, Ampersand, BTL, Galderma, ISDIN, Lumenis, Lutronic, and Merz; is a speaker for non-CME services for Allergan, BTL, Galderma, Lutronic, and Merz; and conducts contracted research with Allergan, Ampersand, and Galderma. Dr. Bloom receives consulting fees from Allergan, Aqua Pharmaceuticals, Cearna/OcuMend, Endo Pharmaceuticals, Galderma, InMode, MEND Nutrition, Merz, Remedly, Revance, RightResult, Sinclair, and ThermiAesthetics; is a speaker for non-CME services for Allergan, Alma Lasers, Galderma, InMode, Merz, and ThermiAesthetics; conducts contracted research with Allergan, Galderma, and Zeltiq; and has ownership interest in Cearna/OcuMend, MEND Nutrition, and Remedly. This activity is supported by an independent educational grant from Galderma Laboratories, LP.